Its really strange how our minds work! I am so used to a particular dates for my events that I completely forgot that I am yet to do the round up of the wonderful Monthly Mingle this time featured on my favorite topic Kids Lunches. Thank you Meeta for giving me this opportunity for a wonderful mingle, we have quite a feast to choose from! We have a wide range of dishes to select to satisfy that most important person in our life! Our Kids! And what a varieties, I was simply so satisfied to see the different entry dropping in each day. I have bookmarked almost all of them, so I expect you too. When I thought Kids lunches, I didn’t really restrict to just lunches, but more of what you can make your kid to eat in terms of carrying a packed meal. But it could include snacks and other items too. I was happy that the participant not only thought out of box but came up with some good choice to whip up when the kids get bored with the same dishes. So lets proceed with the entries and feast ourselves! Putting the entries into some category always makes it easy to appreciate. So that’s what I have done. Thanks all participants for sending in their lovely entries. I have ensured I have not missed any entry, but my apologies if something got missed. Do drop a line, will amend it right away! Lets get on to check out, First on the go comes two lovely sets of full lunch boxes. Bhawana has outdone herself by giving us a menu that can cater to all three meals of a kiddo’s day. And the items she has lined makes me want to reach out, am sure many kids would love to have these made for them too! Next comes Jaya with some wonderful ideas to pack for a toddler’s lunch. Homemade always make these snacks great and when the kiddos love them, no question about it. And we also get to peek into some fantastic lunch boxes! Then on the go are some yummy snacks, which I am sure no kid will say no! When you are running out of ideas on what to make for your kids, am sure you would love to know about this delicious dip that Anjali made with curds and herbs. This makes a great stuffing for sandwiches that you can pack your little ones for lunch! Then we have one of the jugalbandit reminisce on her baby days. She says when she was a baby, she could’ve been easily fooled by her mom to eat these delicious Horse Gram Cocktail Fritters, if she was told they were “beef croquettes”. I really wonder why, they look so yummy as such! Hop on to read another interesting account of Bee’s journey towards being a better kid! Next entry is from the creator of this beautiful event Meeta. Her pictures are always breathtaking, and she gives another ace with this bowl of fish fingers coated with cornflakes to be accompanied with Veggie chips. Let alone her son, her picture tempts me to grab some right off the screen! Then we have Nithyasri making some interesting cones /a>that would serve as a great snack for the kids. Its not only interesting but healthy too as she makes it with sprouts. Finally we have Parita coming with some Sweet Corn Frankie, which are simple to just pack and go for a picnic! Am sure kids would love to bite in these delicious frankies! And she talks about chaat chaat, well guess everybody’s mind is only of chat! Next we have some cool side dishes that make a great combo with either rice or bread, and most important Kid friendly! First on the list is a cool and delicious curry from Aquadaze! Though Aquadaze is crazy about eggs, it didn’t get rub off her lil one. And she doesn’t eat it if its not made as this yummy looking Egg Curry. with Milk and cornflour, it sure is a different one to try! Next we have Arch sending in a full lunch menu that she made for her lil one. Having a no fussy kid is a God’s gift to mother and I am sure many will be J hearing Arch praise her adorable 3 year old, who would want Roti subzi instead of chips and burgers. So she prepares a spread that includes Palakwali Moong Dal, Paneer Burjee and Carrot Raita. Now that’s a lunch I won’t mind having too! Bhagyashri brings in an amazingly simple potato stir fry that her daughter loved so much. She just couldn’t believe this dish was so simple to make, yet made her go for a second and third serving when she had it in a restaurant! Then we have Ekta trying her best to get veggies into her daughter’s lunch. And she says Chana Dal with Laukiis the best way to get her daughter eat lauki. Not that she loves lauki, but she hardly finds it in the dal! Well it helps to have such clever cooking! We then have Kayal bringing in two dishes for the mingle. Her Arai Keerai Kootu is sure an healthy one to get the kids eat. Its interesting to note that her kid loves this green leafy dish. Well if only all kids were like that, but anyways there is no harm in my trying this out I guess! 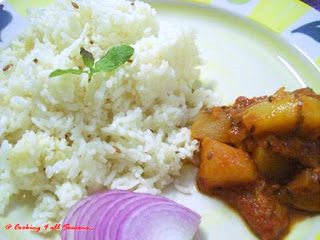 Another simple dish that her child loves is this Simple Veg Curry. She uses peas and cauliflower, which he ensures he eats from everybody! that’s so cute…This curry is not only tasty but very simple to make. Mansi comes up with this simple and easy Kadhai paneer that you can make in a jiffy to pack for your kid. Am sure this makes a great one for dinner too! Then we have Priya talking about the most loved veggie of all, especially by the kids. She sends in a simple quick Potato dish that her niece and nephew love and it can be paired with chapati, stuff between a sandwich, the choice is yours entirely! Sheetal shares her childhood favorite dish Gul-Amba, that her mom used to make for her. Now her child enjoys when given. She says this makes a great side dish for rotis and you won’t want for anything else! From an Andhra kitchen comes a Chili con Queso, a Mexican delight! Well our dear Uma is all set woo her kids with a protein filled plate that takes care of all the diet needs of the day! Next comes One pot meals which makes it all easy and of course the parathas! Anjali shares this wonderful incident she had with her nephew and how she made him eat this delicious looking beet rice. She takes special care to make them arranged in a lovely mound that’s easy for kids to scoop by themselves! Next we have Meera sending in a wholesome packed meal with her Methi Mushroom Makai Pullao. Am sure this works out well on its own for lunch and you really don’t have to worry about adding anything more! Parathas are a great dish for lunch and am sure kids love them. I loved the fact that Parita made them look so colour with her Bell Pepper and Spring Onion Parathas! If there is one thing I love, its chapatis. What’s more if I get it colorful. But then I remember its for kids this time and say yes my kids would love to this lovely Rainbow Chapathi that Sujatha sends in! Sweatha makes a wholesome lunch with Chickpeas and Vegetable in Rice. This mild rice makes it perfect for the kids and can be easily made. I am sure this helps when we run out of ideas! Another interesting healthy one from Vibaas is the Tofu Parathas. Her kids loved it until they heard that the parathas were stuffed with tofu. Guess it helps to keep certain things secret! Now that we are done with rice and parathas, am sure you are looking forward to one plate servings that works out well with kids. First on the list we have A&N, on the way to get their version of burgers patented by coming out with a burger version named AnBurgers. They say its not only healthy but makes it more interesting if we could get the kids do it along with us. Well if only they know! But anyways the looks of the burger is sure enough to tempt me try it out! Then comes a redesigned idly taking a different form. Anu says when kids feel bored to eat the same old idly, change it to take a different look by making it as Upma. Imagine the surprise the kids will have opening their lunch box and peeping into a prepped up Idly! Now Mac and cheese with Italian Sausage, sounds just the right one to interest any kid. And if it comes from Asha, it sure will be great. She says this is what her kids prefer on a weekday dinner, am sure it fills and sits well with any age group! This Kid’s lunch pack from Cham makes me want to carry one! She packs in Vegetable Noodle, with some fruit yogurt and juice. Now that I call a perfect one to feed a hungry kid! EC comes up with a simple yet tasty version of Eggless masala toast, that can make a great snack for kids! I know this being so common may not even come to mind, but looking at the beautiful picture sent by Food Fanatic, reminds that upma is yet another delicious option when you don’t know what to feed your kid! Prajusha makes this delicious and colourful looking Ribbon sandwich that will make a great lunch. The green chutney along with the other veggies, makes sure you have your fill of nature’s best! Rajee cooks up this wonderful looking Cracked Wheat with Tomato Upma, which warms up any cold day! I know it makes a good one to pack for your kid, and the things you can add to this are so many that you can never exhaust all! Dosas I love, and Shubha makes it even more interesting by making in as Numbers! What a cool way to get your kids learn numbers. Her Dozza is another healthy way to make kids eat veggies! Knowing how much my kids love this Puffed Rice uppma, I can say without doubt that this can be all kids favorite. And looking at sukanya’s delicious plate, there leaves no doubt, am sure! Reading Vibaas, I felt my head nodding, well I guess its most common scene that she was talking about. She says she has tough time getting the veggies taken by her kids and resorts to sneaky ways to get them done, am sure I will follow suit if they loved these Cheese Toast with Cauliflower and Peas! First on the parade is one yummy looking bread from Bharti. Banana Bread or Banana Cake how different can it be. Well the pan makes the difference I see and so says Bharti too. She bakes these bread and serves for breakfast. Of course they make a great lunch box item too for kids and its healthy too! Then we have Ivy remembering her childhood days and getting nostalgic about eating these aromatic Cypriot Cinnamon and Raisin Bread Rolls. I know they will any kid want for more. With the goodness of cinnamon and raisin, these buns make a great snacks to be packed! For Miri, its a delicious discovery, finding this Instant Handvo that she was meaning to prepare for over a year. And making it instant made it also possible for her to pack these for her lil one! How sweet, I mean the fact that her lil one is enjoying the dish! If you want to woo a kid, there is nothing better than a cake. Nags gets better by making these lovely Butterscotch Blondies for her young nephews. I am sure kids would love to pack these along to feast on them! Soma makes her princesses eat these Cheese & Pasta Mini Cups by cleverly coming up with ways that she can sneak healthy stuff into cups. I am sure her kids enjoyed these treats! Yasmeen packs in one yummy pockets. She had me drool for long with the choice she has, what with Mango jam and vegetable pockets that she makes for her kid. When you are in a rush, do read out her post to know how you can quickly get these done! Well we also can think of these delicious non veg dishes to give protein and other things for the kids, so check out some interesting entries! Deeba can make your head spin with her delicious cakes and desserts and its no wonder that she can extend theme to these delicious looking Chicken Quesadillas, that her kids love. Looking at the wonderful plate that’s so wholesome makes it more inviting! I was really happy seeing Lisa’s entry. Not only is this her first event entry, but first post too. And imagine dishing out such a delicious Risotto with shrimps and mushrooms, which her family enjoyed a lot! Then we have Priya sending in couple of dishes that sure sound very interesting for a kid!. Trust her to come out with such a flavourful plate. Chicken Fried Rice with Pepper omelette is such a tempting combo that a kid will surely not say no! Then she makes this super healthy combo meal for her kid that’s not only interesting but is more on the lean mean side of the fat! French Beans n Baked Chicken Crisps are perfect for anytime! Cultures may be different, but I wonder at the similarity we at times have with such a different cuisine! This delicious sounding Quince Halvas Nistisimos are from Ivy and they are almost same as our yummy halwas and make a great treat to kids! Joanne gets back to make a pizza in Greek Style and yeah its one tempting one! So its no wonder it got disappeared the moment it was made. The kid in me wants to grab a slice or two! Supriya comes out with a beautiful looking Green Butterfly Pasta, which her daughter liked very much. I am sure it was more because of the green colour that the kid was attracted and the taste complemented the lot! Varsha sends in some lovely Healthy Oats-Nuts bar, that can work out best when you are planning to pack some healthy snacks for the kids. Best part being it can be stored and served. Then we have Sree Vidya bringing in multiple choice for us to choose and each of them sound more interesting than the other. Am sure it would not be chore getting the kids eat these delicious Gobi Manchurian or the fancy Kathi roll. Her Macaroni hot pot is something to get done in jiffy not to mention the Paneer bhurji that can save your day anytime. But lets start it all with her Nutty n Creamy Veg Soup, it sure to make anybody crave for more. She adds in nuts along with veggies, which makes it a ideal wholesome food for kids! Even if you can’t pack it regularly, am sure you will find a way to send this along if your kid gets to fancy this! Or this yummy Coconut Milk Pulav, which am sure any kid will fancy. So that’s a great idea to share with other mommies right. This pulao is mild and is quite easy to get the kids take this! Then we have Vidhas sending in some 9 different dishes to choose from. Vidhas makes this nutritious pulao with broken wheat with the goodness of veggies included. Not only the kids love it, they can carry this for their lunch box! This simple mexican rice from Vidhas is an ideal one to please a kid. Its mild, yet interesting and colourful to attract a lil one! I guess most kids love paneer and making different dishes with it, makes things little easier for us. And Vidhas comes with her versions of bhrji and parathas which sure will get any kid finish off the plate! Vidhas makes this poori masala which I know is everybody’s favorite and esp kids, who can have this anytime of the day. So when you run ideas to make for the lil angels, think of this! Hope you enjoyed the varieties! Very Very COOL ideas. I bet all moms are going to appreciate this round up! those are indeed very good recipes and ideas and I really appreciate your effort to put things so beautifully..
Hi Valli, Awesome round up. Always I admire the way you present the round up. I ams os happy to be a part of this. The way you included my recipes is simple awesome. I just mentioned that what I made is ideal for kids. Really appreciate the event round up! I’ve just gone through roughly for now would love to come back and spend some more time on this fantastic round up post. Thanks for the beautifully written presentation it’s a pleasure to read. I have made a post about this round up in my blog thanking your efforts. thank you for this great effort, dear srivalli. Its amazing the stuff people have come up with. Good show, Srivalli! No Mom can complain now. All you got to do is get your kids to this page and let them select! Thanks Srivalli for the hard work put in to round off so well. Great round-up Sri..thats quiet a collection. Thanks a loT valli. Great ideas for the kid lunch! Hey, Great round up!!! I missed it! I will try the maximum recipes! All are very good and tempting! !Thnx Srivalli, great job!